The most advanced ergonomics, durability and an unsurpassed view wrapped into a fully automated, compact design. Nikon’s latest evolution in clinical microscopy. The Nikon Eclipse Clinical Upright Microscope Ci-E offers the most advanced ergonomics, durability and an unsurpassed view wrapped into a fully automated, compact design. “Feel the Evolution” through the simultaneous switching of the objective lens, condenser and light intensity so you can concentrate solely on the specimen without concern for microscope operation. “See the Evolution” through the revolutionary combination of patent pending fly-eye technology and the world renowned CFI60 optical system. The new conveniently located controls allow you to concentrate on the specimen without concern for operation. In addition to simultaneous switching of objective, condenser, and intensity, the controller employs six mode & memory buttons for programming and operating optical settings for each objective position. The simple toggle function allows easy switching between any two objectives, which is especially useful in cytology. 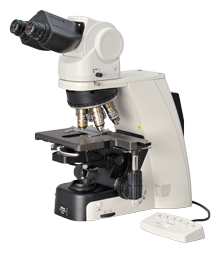 The Ci-L incorporates a high-intensity LED optical system that is IR-free, significantly minimizing eyestrain for users spending long hours at the microscope. LED illumination also offers very low power consumption and heat generation and eliminates color temperature changes that occur with halogen light sources. A variety of microscopy techniques are supported, including darkfield, simple polarizing, and sensitive color polarizing for gout testing and phase contrast. *For those not in need of an LED system, a halogen model (Ci-S) is also available. The Eclipse Ci Series continues to offer Nikon’s unmatched patented in-line focusing where the stage handle and focus controls are positioned in-line for maximum ergonomics. This enables you to sit square and straight during operation with wrists resting comfortably on the countertop. The new ergonomic binocular body is extremely durable with a stylish design to match the natural design of the microscope. 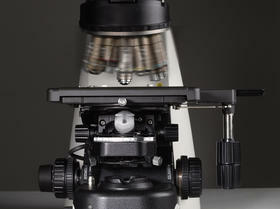 The ability to add riser tubes for height adjustment to the unique tilting and telescopic capabilities ensures that the microscope fits you perfectly rather than you being forced to fit the microscope. The incredible view provided by Nikon’s proprietary CFI60 optics is now enhanced with new patent pending “fly-eye” technology. By combining the collimator lens and fly-eye optics with the whitest LED and Nikon’s CFI60 optics, the brightest, sharpest, most uniform crystal-clear images can be obtained even in high magnification. The new stage design employs the highly reliable rack and pinion design for effortless motion as well as a height adjustable handle to fit your comfort level. The new surface design is scratch resistant and allows fast and easy slide changes. Without removing your eyes from the eyepieces or hands from the microscope, simply press the conveniently located capture button to capture high resolution digital images directly to the server, camera controller, PC, and various other types of digital media. The Ci’s built-in network connections enable virtually instantaneous remote viewing and distance collaboration. The enhanced brightness of the Ci-E can handle 5-10 headed teaching configurations and a new LED pointer is one of many available accessories.